Youâ€™re a kinetic artist, and build Rube Goldberg machines. What does that mean? I make chain reaction machines that perform a simple task via a convoluted sequence of events: string pulls hammer, hitting ball, breaking vase, etc. Theyâ€™re often known as Rube Goldberg machines, named after the famous cartoonist who used to draw such absurd contraptions 100 years ago. Your work is quite aesthetic. Youâ€™re obviously not just thinking about what the machine does, but how it looks while itâ€™s doing it. Where do you begin with designing the experience? I get most of my ideas my observing the world around me and taking the time to play with it.Â Walking in the supermarket I once knocked a bottle of ketchup off the shelf and it rolled down the aisle in a really cool way. I then proceeded to play with all the bottles of ketchup in the aisle until I found â€œthe best rollâ€ which I eventually used in a machine. Trial and error presumably plays a pretty large role in your work. What was your biggest error? Does the process of experimentation ever get dangerous? My current project is taking me a year to complete and will be five minutes long. Most of my ideas come from playing with objects and discovering interesting things I can do with them. Then there is a LOT of trial and error to get it to work every time. Sometimes I will spend two weeks on something that only lasts four seconds. I don’t move on until I see it work fifty times in a row. My biggest error was in using acetone one time, which looks just like water but reaches boiling point much faster. I forgot that it is also highly flammable. The first two attempts worked like a treat, but on the third it caught fire and most of The Page Turner caught alight, spraying melted sponge everywhere, which was really hard to get off. And it almost burned the house down. Although the machines themselves have a limited apparent use, paradoxically the materials that make up their various component parts are consistently exploited for a variety of functions beyond their conventional purpose. Has it become impossible not to think about how you might MacGyver random objects to work with aspects of a machine? I like to use familiar objects in unfamiliar ways. My goal is for people to think twice about the endless possibilities in the everyday tasks and objects that surround them. How do you decide what materials to use? Do you scout around and purchase specific items, or do you collect and tinker? Do you live with any of the machines â€“ or with any clever hacks â€“ in your everyday life? Iâ€™m imagining that mornings at your place might be kind of like the breakfast sequence in Pee Weeâ€™s Big Adventure. Iâ€™ve made a lot of inventions to improve my life. I had strings to turn the light off from bed. 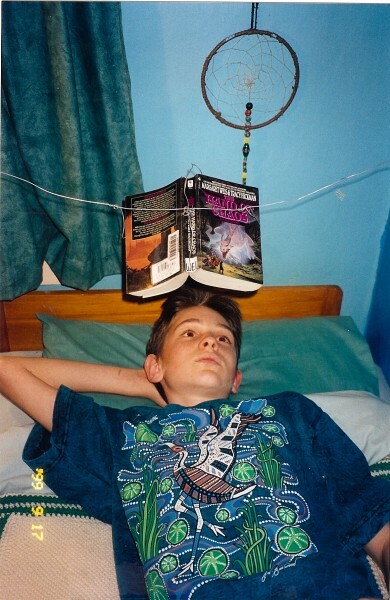 Reading The Lord Of the Rings at the age of ten was rather heavy for my young arms so I made a machine to hold the book above my head. When I was twelve I made a machine that made any drink carbonated; you pushed your drink into a hole in a box and the machine dispensed equal amounts of citric acid and baking powder, which made a bubbling reaction. Speaking of pop culture representations of Rube Goldberg machines, they still manage to get quite a bit of play. In addition to your recent guest spot on Sesame Street, OK Go did a music video involving a very elaborate machine and the IFC network show Portlandia did a sketch involving a child who builds them. 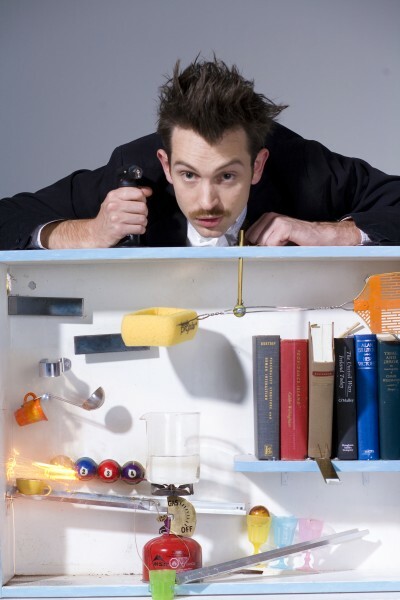 What do you make of the popular staying power of the Rube Goldberg machine? At first I wondered if Rube Goldberg machines were just a fad, but if you look more closely humans have always been fascinated with these sorts of machines. People have been drawing absurd devices long before Rube Goldberg was around. I love the work of Fischli and Weiss; the way those normally inanimate objects became characters in their surrealist landscape. I use similar whimsical interactions, but I try to contextualize it in more of a narrative with a beginning and an end, and incorporate people and animals. I want people to imagine having machines like these in their own homes, so they see the potential for play inherent in everyday life. I am working on The Dresser, a machine that helps me get dressed by ironing my clothes, shining my shoes, putting on my hat, etc. It is my largest and longest machine to date; a 30-foot traveling show that can pack up easily and be performed anywhere in the world. The first performance will be in Charlotte, North Carolina, on November 9th at the end of my time as Knight Artist-in-Residence at the McColl Center for Visual Art.